Range map atlas for insects? I often use BONAP's North American Plant Atlas, for researching plant taxa ranges. 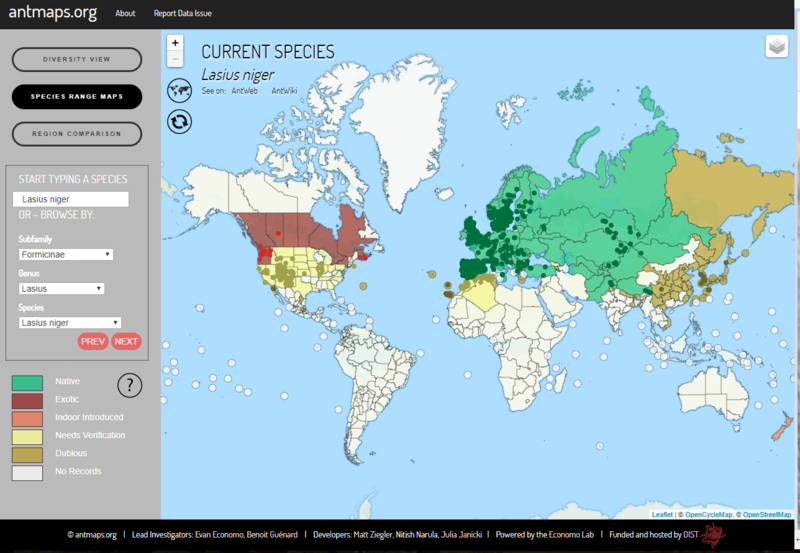 However, I have so far been unable to find a similar online atlas (or any range-map query tool) for insects. Does anyone know of any similar range-map resources for insects? I've just recently discovered a range map site for ants: antmaps.org. antmaps.org is not a database per se, but rather a client-end tool for visualizing and interacting with the GABI database. The Global Ant Biodiversity Informatics (GABI) project (Guénard et al. 2017 Myrmecological News) is an attempt to consolidate and curate a comprehensive global database of ant species distributional records, including literature records, museum databases, and online specimen databases. As of July 2018, the database includes records from over 9300 publications, most major digitized museum collections, and specimen databases such as AntWeb. In total, the database now has over 1.9 million records including around 15000 described ant species and subspecies. The GABI data are currently housed in a PostgreSQL database that synchronizes once per week with antmaps.org. Antmaps.org is intended to complement other invaluable web tools for myrmecology such as AntWeb and AntWiki. Guénard, B., Weiser, M., Gomez, K., Narula, N., Economo, E.P. (2017) The Global Ant Biodiversity Informatics (GABI) database: a synthesis of ant species geographic distributions. Myrmecological News 24: 83-89. I think the Global Biodiversity Information Facility may be what you are looking for https://www.gbif.org, it is not limited to plants and insects. 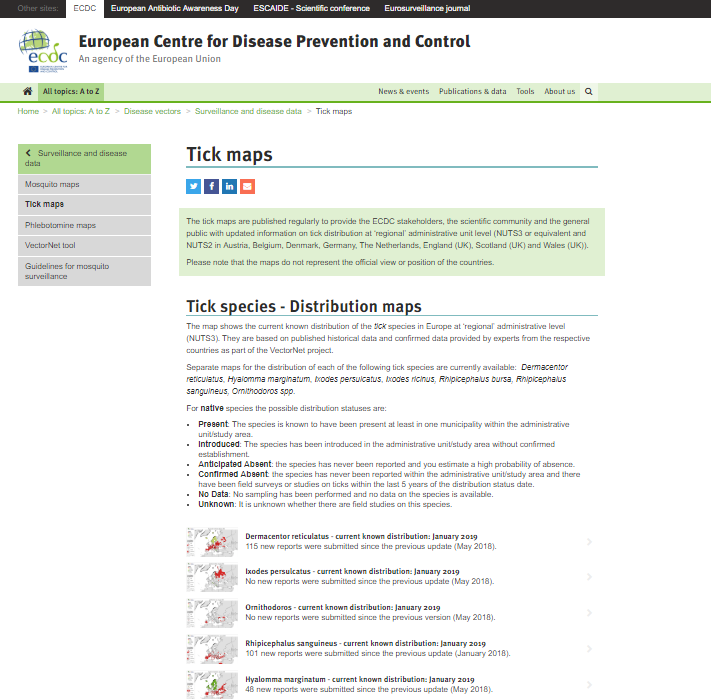 The tick maps are published regularly to provide the ECDC stakeholders, the scientific community and the general public with updated information on tick distribution at ‘regional’ administrative unit level (NUTS3 or equivalent and NUTS2 in Austria, Belgium, Denmark, Germany, The Netherlands, England (UK), Scotland (UK) and Wales (UK)). 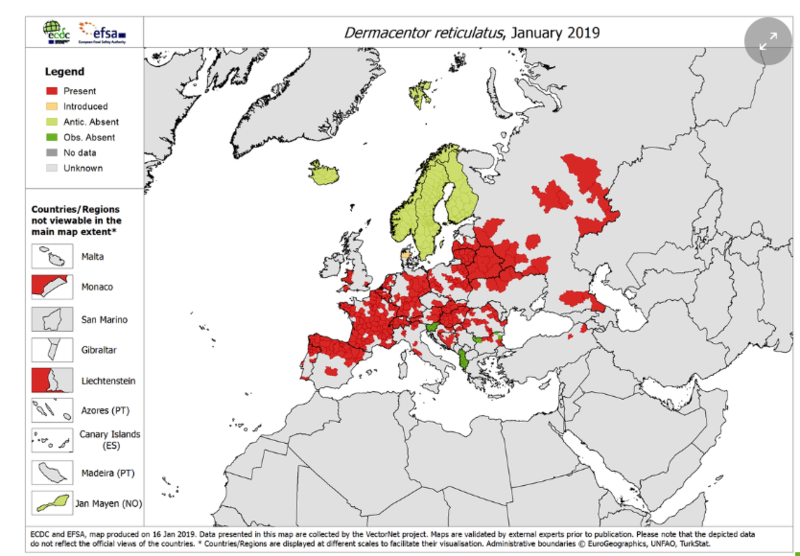 The ECDPC site also provides maps for mosquitoes and sandflies in the included European countries. Not the answer you're looking for? Browse other questions tagged entomology research-tools biogeography or ask your own question. Tiny white very hard cell bug! Please help to identify! I am looking for examples of polyandrous insects? Are these two same insects?